A few months ago we picked up a gorgeous copy of Nigel Slater’s 2009 cookbook, Tender. It was late winter and we were desperate to start our little garden. As we perused our favorite little bookshop this book stood out amongst the others with its gorgeous cover and tag line of a cook and his vegetable patch. This cookbook incorporates everything I love about a good book. Beautiful photographs, gorgeous fonts, stories, recipes and really helpful advice about both the garden and cooking. If you’ve ever watched Nigel Slater on television you will know that he is a very calm cook. He makes everything look easy and utilizes the “I used what I had” philosophy. At our house we seem to do that a lot too, especially when Wednesday hits and I realize everything I bought on Saturday has quickly disappeared. As summer wraps into fall we are still taking advantage of cooking outside. Salmon is one of those fish dinners that can easily make the summer to fall transition depending on how and what you serve it with. We cooked the salmon on the grill until the skin was super crispy. Do you love crispy salmon skin as much as we do? It really adds a great texture to the basic salmon. The star, though, of this recipe, was Slater’s lemon salad. The most simple idea ever- but yet one that adds so much to this staple of our summer recipe collection. A combination of superfine sugar, olive oil, flat-leaf parsley, capers and lemons (which had been sliced super thin with much of the white piths removed- side note- we love how pretty these lemon slices looked whole, but we either need to refine our pith removal skills or segment the lemon next time), was allowed to sit in a bowl for a few minutes and then spooned onto a warm plate along with the salmon. 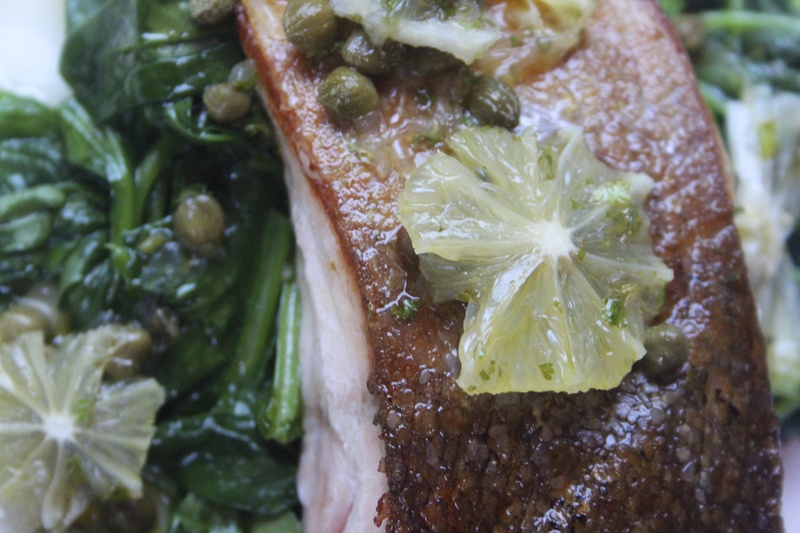 The addition of the olive oil and capers made the salmon much more decadent than it already was on its own. It is one of our favorite recipes from this book. We can’t wait to try out his recipe for pumpkin pangrattato with rosemary and orange later this week. Do you have a favorite Nigel Slater recipe? We can truly say we haven’t come across one yet that we did not enjoy.